You won’t see any fences or cages in our facility. K9 Kampus has large luxurious suites that include fun themed rooms filled with calming colors and comfortable amenities to make your loved ones stay enjoyable. With our luxury boarding, your loved ones will automatically receive our Daycare Services where they will play all day with other dogs and our Pet Pals (providing they have passed the temperament evaluation). When it is nap time, they will be escorted to their private quarters and then brought back out to the play area when nap time is over. If your dog does not meet the requirements for Daycare or has physical limitations we will recommend alternatives to Daycare Play in order to provide a wonderful experience for your four legged family member. For a pet that has never boarded with us before, a daycare trial or overnight trial visit to the facility may help your loved one get used to the idea of being away from his family. 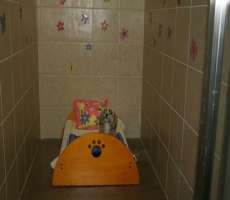 During his/her stay, your pet will get to know the staff and have fun playing. When you return, your pet already knows they will have a good time. Please note that if you have not been to our facility, a temperament evaluation will have to be completed prior to your stay. K9 Kampus can accommodate a temperament evaluation during your boarding stay but it must be pr-arranged and it is not recommended. Tuck in: We will tuck in your loved one with hugs, kisses and their favorite blanket. Bedtime Story: We will snuggle up with your loved one and read the bedtime story of your choice or if you prefer we can recommend some of our most requested stories. Training Walk: Your dog will take a walk with a Pet Pal around our indoor training walk. This walk provides a great one-on-one time with a Pet Pal while lead training in a safe climate controlled environment. We recommend ¼ mile increments but you can request shorter walks for smaller dogs, dogs with limitations and dogs in rehabilitation. Training: You dog can have one-on-one trainer time; a custom designed training program will be developed for your loved one by our training coordinator. Boarding reservation require a 50% non-refundable deposit to secure a board stay. All our suites are spacious with two sizes to choose from; a 4x4, 4x6, 4x8 or 8x8. Our boarding rates include indoor and outdoor day play so your loved ones will enjoy playing all day in our play areas with our Pet Pals and other dogs. 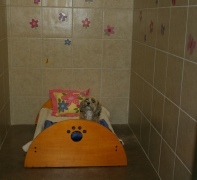 All dogs must complete and pass a temperament evaluation prior to reserving a dogcation/boarding stay with us. Our Basic suites come with indoor pet pottys, webcams and Kuranda beds, some have flat screen TV’s too. Boarding prices are based on a 24 hour period from the time that you check in, to the time that you check out. For details on our fee structure please see our Boarding Agreement that outlines the fee for an example boarding stay. 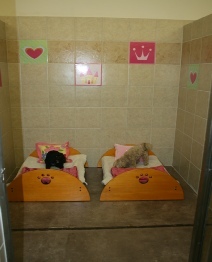 Discounts available for multiple dogs from the same family in the same suites. Slumber parties will be offered at various times of the year. All dogs that wish to participate in slumber parties must have had a temperament evaluation and participated in daycare previously. No personal items allowed when participating in slumber parties. Cost of slumber parties will vary depending on when they are offered. 1. Food: We suggest bringing your own food, it keeps your dog on his current diet which is better for his digestion system. 3. Personal Items: Although we allow you to bring personal items from home to place in your dogs suite during their stay, please note that you do so at your own risk. K9 Kampus does NOT assume any responsibility for lost or damaged items. We suggest keeping sentimental or expensive items at home, as K9 Kampus will not replace any items you choose to bring for your dogs stay. a. Bedding: We allow you to bring whatever you want for your dogs suite. We suggest items from home that will make your dog more comfortable while you are away. a. Medication should be brought in the original prescription bottle. b.Please bring only the number of tablets/servings needed for the stay. Canceling aboard stay with a minimum of 72 hour notice will place your deposit on your K9 Kampus file to be used towards a future board stay. Canceling with less than a 72 hour notice will forfeit your boarding deposit. Last minute or same day reservations are held to the same non-refundable policy.